Why this project? / Perché questo progetto? 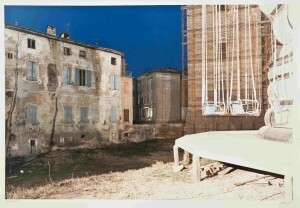 Luigi Ghirri, ‘Scandiano. Fiera di San Giuseppe’, from Il profilo delle nuvole (1989). Copyright Eredi di Luigi Ghirri. This project stems from my interest in contemporary Italian literature and photography, in the work of Gianni Celati, Luigi Ghirri and other writers and artists, and in space, place and landscape studies. My interest in Ghirri started to develop about ten years ago alongside my study of the literary representations of space and place in the work of Gianni Celati, Daniele Benati, Ermanno Cavazzoni, Giorgio Messori and other writers who collaborated to Ghirri’s projects on the Po valley in the 1980s and to Celati’s projects since then. What sparked my fascination for the work of Ghirri, Celati and others was the exhibition Racconti dal paesaggio, 1984-2004. A vent’anni da ‘Viaggio in Italia’, curated by Roberta Valtorta at the newly opened ‘Museo di Fotografia Contemporanea’ in Cinisello Balsamo (Milan), http://www.mufoco.org/, which I saw in February 2004. Equally inspiring was listening to Gianni Celati, Gabriele Basilico, Roberta Valtorta and other artists and scholars talk about the importance of that experience at a seminar organised in occasion of the exhibition. In May 2007 I organised with Laura Rorato a conference on ‘Letteratura come fantasticazione’ at the University of Leicester. A British Academy Conference Grant allowed us to invite to Leicester guest writers Gianni Celati, Daniele Benati, Ermanno Cavazzoni, Jean Talon and Enrico De Vivo, who engaged in lively discussion of their work with the scholars who attended the colloquium. By continuing to work on these and other writers, I came to realise the importance that photography, as well as cinema, art history and aesthetics played in their texts, as in Ghirri’s work. As I furthered my study of Ghirri’s photography and of the context in which he operated, I soon realised that, although the critical literature on his work in Italian is extensive (including the work of Mussini, Quintavalle, Gasparini, Taramelli, D’Elia, Re, Marra), more work was needed to appraise his art in full and from an interdisciplinary angle – the angle that he himself embraced. It also became apparent to me that, despite being widely celebrated in Italy, Ghirri’s art was and still is little known outside of Italy, as not many of his critical essays are available in English translation and few academic publications have appeared in English. Part of the aim of this project is to redress this and to bring Ghirri’s photography to a wider audience, especially outside Italy, and also the to broaden the study of the work of other artists and writers who collaborated with Ghirri or with Celati or who worked independently on urban, rural and marginal or interstitial places, such as, among many, photographers Vittore Fossati and Guido Guidi. 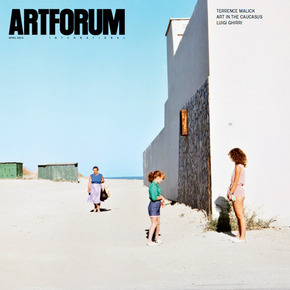 In the last few years Ghirri has increasingly being recognized as one of the leading Italian photographers of the late twentieth-century, both in Italy and abroad, thanks to a greater number of recent publications in English – for example the reprint of his first book, Kodachrome (1978) by MACK (London) in 2013, http://www.mackbooks.co.uk/books/44-Kodachrome.html, and Maria Antonella Pelizzari’s article on Ghirri on Artforum (2013), which gave Ghirri its front cover – and thanks to a growing number of major exhibitions. These include, among others, Elena Re’s Project Prints (Mummery & Schnelle, London, 2011, http://www.mummeryschnelle.com/pastpages/ghirri1.htm; Castello di Rivoli, Turin, 2012, http://www.castellodirivoli.org/en/mostra/luigi-ghirri-project-prints/), La Carte d’après nature, curated by Thomas Demand (Nouveau Musée National de Monaco, 2011; Matthew Marks Gallery, New York, 2011) and Kodachrome (Matthew Marks Gallery, New York, 2013, http://www.matthewmarks.com/new-york/artists/luigi-ghirri/). In 2013 Ghirri’s work was exhibited at the Venice Biennale (1 June – 24 November 2013, http://viceversa2013.org/en/artists-biennale-venezia-exhibition/luigi-ghirri.php), and the MAXXI in Rome organised a major retrospective of his work, curated by Francesca Fabiani, Laura Gasparini and Giuliano Sergio: ‘Luigi Ghirri, ‘Pensare per immagini’’ (23 April-27 October 2013), http://www.fondazionemaxxi.it/. All these recent exhibitions and works in English testify to the increasing interest in Ghirri’s photography worldwide. About ten years ago I was introduced to Jacopo Benci by a former graduate student, Kate Litherland, who at the time was carrying out some research at the British School at Rome. Since then Jacopo and I have continued to correspond and exchange ideas about Ghirri and Italian visual arts and cinema. More recently we organised two panels on Luigi Ghirri at the Society for Italian Studies conferences at the University of St. Andrews (July 2011) and of Durham (July 2013). In April 2013 with Jacopo’s support I applied to a British Academy-Leverhulme Small Research Grant in order to continue deepening the study of Luigi Ghirri’s photographic and critical work and, more broadly, to investigate the intersections of Italian photography, literature and space/landscape theory. The award of the British Academy’s funding allowed us to start working on the project in September 2013. From its onset the project has been well received in Italy, in the UK and elsewhere. The first conference – ‘How to think in images? Luigi Ghirri and photography’, which was held at The British School at Rome (http://www.bsr.ac.uk/) on Wednesday 9 October 2013, gathered a wide audience of artists-photographers, scholars and students interested to further the study of Ghirri’s work. A number of people have already joined our network. In the next blog you can find out a detailed report of the Conference ‘How to think in images? Luigi Ghirri and photography’, held at The British School at Rome (http://www.bsr.ac.uk/) on Wednesday 9 October 2013.